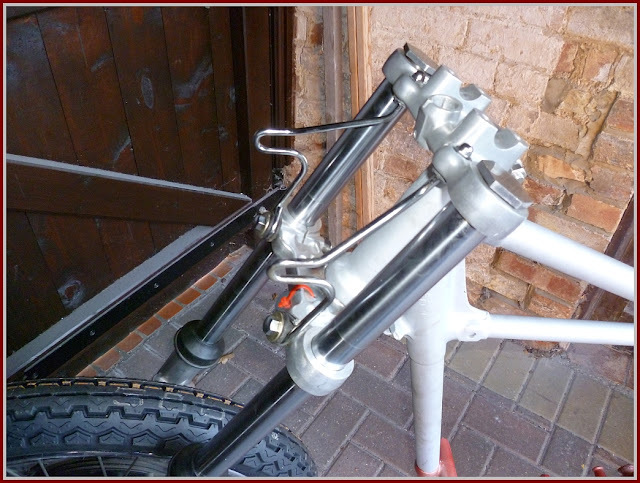 I scored the front legs from Steve at The Strathbran Speed Shop a couple of weeks ago. Although the sliders are correct for a '71 - '73 Conical Hub twin, the stanchions had been changed at some time to suit disc brake type yokes, the earlier type still retain a taper for the top yoke whereas the later ones are parallel. These were swapped out yesterday afternoon, so just had to be offered up to see what effect the non-raked yokes would have. 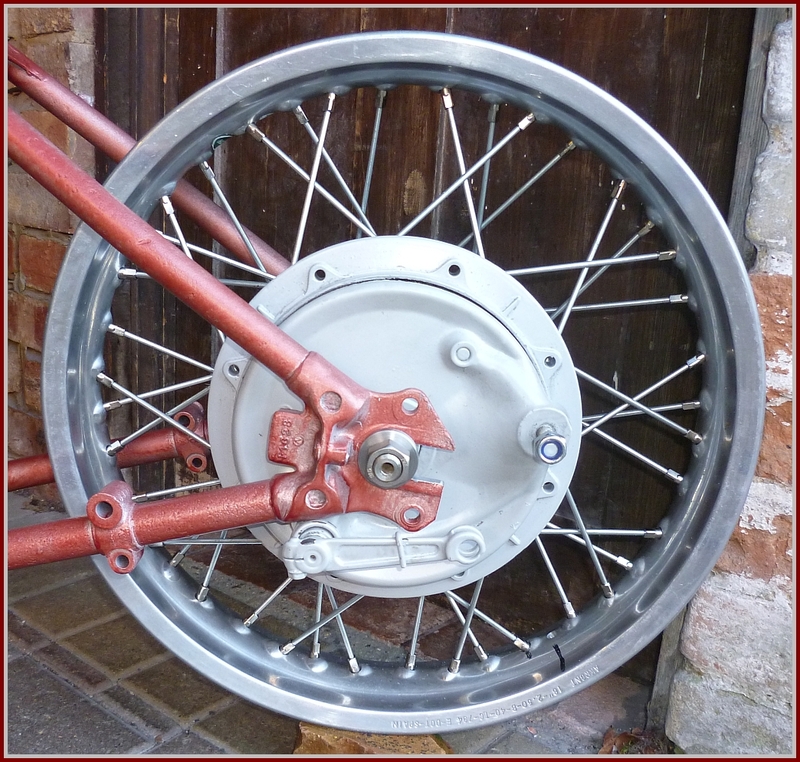 They look OK to me, the front wheel is a 19" and is not the one that will be used but the size is right and there doesn't seem to be a clearance issue. 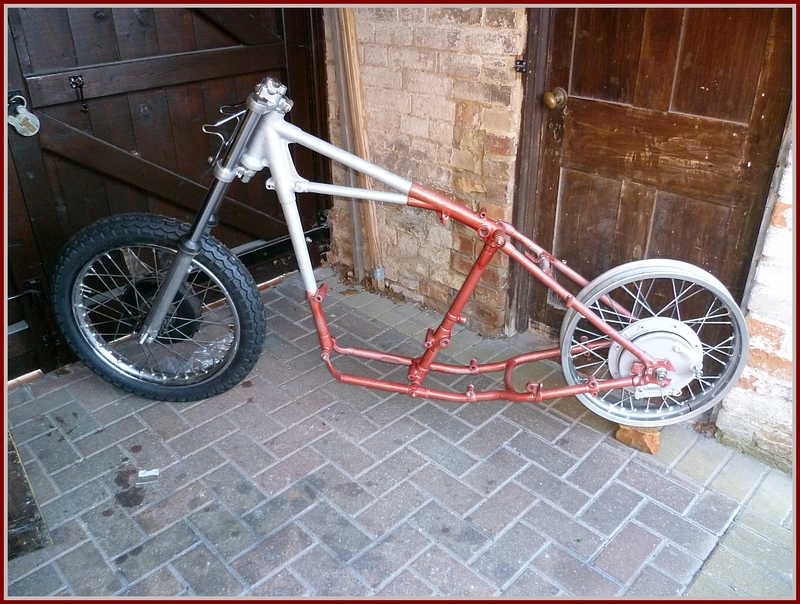 There was some concern that without the in built 10 degrees of rake given by the standard rigid yokes the front end may sit too close to the frame down tube, that's not the case and the steering will be quicker as a result of this change. The wheel dropouts had been butchered at some point in time, using a hacksaw and file, not a pretty site. A local retired engineer managed to set the frame up on his mill and opened the slots up to 7/8" to bring them back to square and even, he also turned up two "top hat" collars to accommodate the 17mm rear spindle. The spindle itself is a modified XL500 Honda item, figuring the make up of the steel would be right to make a spindle out of. A bit of a Homer Simpson moment "They say it was made from a larger spindle"
At the moment I am thinking of making a plate up to pick up the two holes on the silencer/rear footrest lug with a slot to take the brake anchor bolt, above the bottom rail. That will set the brake arm in about the right position and not look overly shite. Staying with the standard headlight mounting method, the holes are there already and it's rubber mounted. Only used by Triumph for about three years at the start of the seventies it's gotta be the most stripped down look for a side mount you're going to get, and it makes a change from the ubiquitous Batesalike bottom mount set up.